At Elsevier, we are keen to support those new to the academic community so that they clearly understand the ethics standards necessary when compiling and submitting a manuscript. In this article, we will explore two of the initiatives we have introduced to ensure students and young researchers can access this training; the Ethics in Research & Publication program and Publishing Connect author and reviewer training workshops. Early in 2012, Elsevier, in collaboration with an an independent panel of experts well-versed in ethics issues, launched Ethics in Research & Publication, an interactive website and program that emphasizes the individual researcher's contribution to advancing science through integrity and good ethical standards. 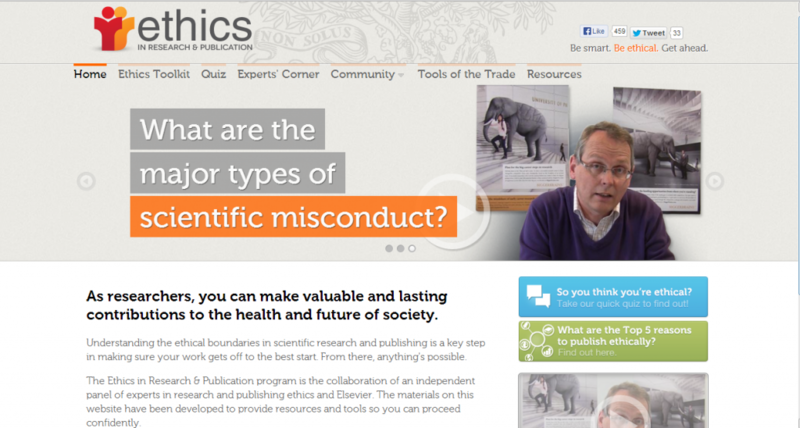 It also highlights the impact misconduct can have on the science community as a whole and on one's career. The clear overarching message of this program is Make your research count. Publish ethically. To make this message resonate, the team looked for creative ways to address the concerns of young researchers while conveying the wisdom of those who have been in their shoes. A major channel for the program has been the interactive website, which has been liked more than 450 times on Facebook and has received a lot of positive attention on Twitter as well. According to Catriona Fennell, Director of Publishing Services for STM Journals at Elsevier and one of the main drivers behind the program, "ethical issues are a shared problem for all involved in research and publishing. We felt our strongest impact would be in providing the tools to help researchers learn the 'rules' and how to comply with them." The interactive element of the program has continued with webinars (organized under the Publishing Connect umbrella) in September 2012, and January 2013, which together have recorded more than 1,500 views. During the last webinar there was live tweeting with the hashtag #PubEthics – a good example of the important role social media has come to play in the program. The webinars have been well received, with 97 percent of attendees agreeing they were satisfied, and 96 percent of attendees saying they would attend future webinars. Throughout 2013, work has continued with further updates to the website – more webinars are also planned for the future. Since the Publishing Connect program for authors and reviewers was launched in 2006, Elsevier publishers and journal editors have jointly hosted training workshops at hundreds of institutions and conferences worldwide. While workshop topics span the full publishing process – from applying for funding to writing and submitting a manuscript – there is no doubt a core element of many events has been the module on ethics and plagiarism. We recently created a new resource for early career researchers called Publishing Crib Sheets. 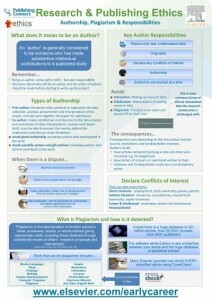 These free to download posters include one entitled Research & Publishing Ethics, which contains information on types of authorship, handling disputes, what constitutes plagiarism and how is it detected, together with the key responsibilities of authors and the consequences of misconduct. During or after each Publishing Connect workshop, participants are asked to complete a short survey. Results for 2012 show the workshops are delivering a much-needed service, with 94 percent of participants agreeing that they found them helpful. Additionally, 81 percent agreed that 'Attending this seminar increased my understanding of publishing ethics'. The Publishing Connect program was recently extended to include bite-sized online training webcasts. Each webcast is up to 15 minutes long and can be viewed in the Publishing Connect training webcasts library. The latest additions to the channel are three new webcasts on research and publishing ethics and author responsibilities – more are in the pipeline. Since January 2012, the series has collectively garnered more than 280,000 views. * This section is based on the Elsevier Connect article How to avoid misconduct in research and publishing. Dr. Inez van Korlaar (@InezvKorlaar) joined Elsevier in 2006. After three years in publishing, she moved to the marketing communications department of STM Journals. In her current role as Director of Project Management she is responsible for global marketing communication projects, which includes outreach to researchers in their role as an author. She has a PhD in health psychology from Leiden University in The Netherlands and is based in Amsterdam. Hannah Foreman joined Elsevier in 2007 as Marketing Communications Manager for journals in Physics and Astronomy. With more than 10 years' experience in communications and relations roles she is now Head of the Researcher Relations team in Amsterdam. This team focuses on delivering information innovatively to editors, authors and reviewers of Elsevier journals, together with ensuring that Elsevier maintains its close partnerships with these vital communities. Hannah has a professional and academic background in European business and speaks four languages.